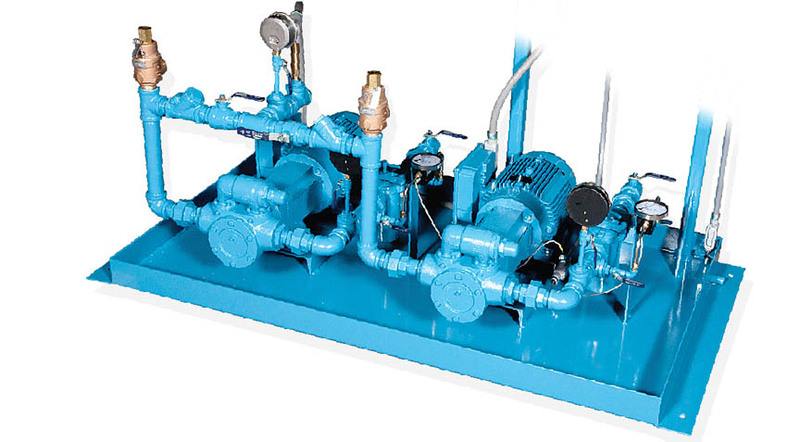 Pump sets are available to meet the demands of your application and facility. 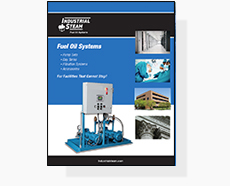 Pump sets can range from very simple systems typically found on boiler loop applications to multi-generator systems involving backup features. Custom designed pump skids for heavier oils or other application requirements are available. All pump skids contain disconnect switches, motor starters, H-O-A switches, power on and pump running indicator lights. Motors are typically TEFC but others are available. Pumps are industrial cast iron pumps, typically external gear but internal gear design pumps are also available. All pump sets include suction and discharge valves, strainers, and suction / discharge pressure gauges. All pipe is schedule 40 using malleable iron NPT fittings. Typically bypass type external relief valves are used, but some applications will require internal relief valves. Control systems can be very simple with only H-O-A starters with a “call for operation” signal or as complex as a system monitoring level probes in several day tanks with controls to select the correct day tank using solenoid or motorized valves. Control system can make use of simple relay logic for the less demanding applications. Most systems are provided with a microprocessor PLC controller. The most demanding applications will typically include communication to master panels and/or building automation systems. All pumps are thoroughly tested at the factory including pressure tests. Pump sets can be customer designed to fit a narrow footprint. Field mounted legs can be used to elevate the pumps set for easier servicing.